This is intended as a new guide to dogs. Because many widespread beliefs about dogs are not only outdated, but also bad for dogs, I want this book to be useful to the widest possible audience. I’ve written this book so it can be read two ways. It can be read as a whole, from chapter one to chapter one hundred. Those who do this will, at the end, have a firm grasp of much of the new knowledge we have about dogs. It can also be used to check each belief separately. You can read the book in bits and pieces, looking up things that strike your interest, or checking something your neighbour, dog trainer or local scientist is telling you. Each chapter can stand alone and will teach you something important. No matter which way you read it, this book will improve your understanding of why dogs do things the way they do, and it will increase your appreciation of this marvellous species so many share their lives with. This book may also even help you understand people better. Please note that when I use the expression ‘normal’ dogs in this book, I mean two things. The first is, dogs who are not of the breeds we have bred for aggression and/or extremely large body size and mass. When I talk about normal dogs, I am explicitly excluding these breeds. The second thing ‘normal dogs’ means is dogs who have had a chance to learn about being a dog from other dogs. The 100 Silliest Things People Say about Dogs are all based on old-fashioned ideas about Nature in general, and about dogs in specific. In this book, I debunk various myths and fables that most people still believe in, replacing them with real insight into real dogs. 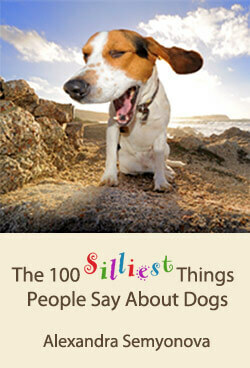 As you read along, you’ll see your dog doing things I talk about in this book. You’ll discover new things in him each day, things you never noticed before because you didn’t know what they meant — or that they even had any meaning. You’ ll also find your relationship with your dog improving, as you interact with him on the basis of real understanding instead of the old dogmas. I hope you will feel the same excitement I felt as I made my discoveries. Even if you’ve always believed in all of the myths this book debunks, you remain innocent of any wrongdoing. You probably, just like me, somehow ended up with a dog one day. And, just like me, you probably thought, ‘I’d better get some advice from an expert, to be sure I do it right.’ When they told you their silly ideas, they probably sounded so self-confident that it didn’t occur to you to doubt they knew what they were talking about. The same thing happened to me. After getting degrees in social and behavioural sciences, I ended up some years later with an adult dog. All I needed to do was use the same techniques I’d used in the behaviour lab — reward the behaviour I wanted, and make sure I didn’t reward behaviour I didn’t like. Piece of cake, perfect dog. I wasn’t exposed to all the stories dog people tell until I got my first puppy. I realised that raising a young animal, with all its species-specific developmental requirements, was a totally different thing than simply applying the laws of behaviour to an adult. Time to research dogs. I read every book I could get my hands on and talked to many trainers. All sources agreed that dogs live in a hierarchy, and that they spend all their time being either dominant or submissive to each other. They told me that even play is about determining relative rank within the group; that any request my dog made to me (to fulfill one of his needs, to play with him) was a secret attempt to increase his own rank in the hope of taking over someday. I was told I needed to make sure I was the Alpha Leader. The nice way to do this involved a number of things, which were explained to me as a sort of psychological warfare. I was told to ignore all requests from my dog. I should always go before my dog through a door, to show that I was the courageous leader. I had to eat first before I fed the dog, since the Alpha wolf always eats first and then determines who gets to eat next. The dog wasn’t allowed on the couch, since the Alpha wolf always lies on the highest spot when the pack is resting. I should never approach the dog, since the submissive wolf always approaches the dominant wolf — but on the other hand, I should make sure the dog moves aside when I’m coming through, since the dominant wolf never moves aside for the lesser pack members (I sort of wondered how I was going to do this one without approaching the dog…). Even if he was lying somewhere, I wasn’t to go around him, but to step over him, because otherwise I was letting him command the avenues of access to the territory. And so on and so on, about how it is absolutely crucial to maintain your Alpha rank. This all seemed a bit far-fetched to me. I wondered why everyone started talking about wolves every time I asked them about dogs. I also kind of wondered why all had gone so well with my previous dogs, who were all allowed on the couch. But who was I to argue with people who claimed to know so much, or scientists who claimed to have studied dogs? Most of the trainers also urged me to train the pup with punishment. I definitely had to get a choke chain, get angry at behaviour I didn’t like, and do things like jerking on the puppy’s neck if he was leashed or, if he wasn’t, throwing cans of coins or marbles at him, or squirting water in his face. But I never used any kind of punishment. I was too experienced in the lab and knew what kinds of horrible side effects punishment has on an animal, besides the fact that you can teach it perfectly well without it. But I did believe the rest, for a while. When I saw dogs together in a park, I thought I saw all kinds of rank-establishing behaviour. But I was only observing the dogs for short intervals, of course. My doubts began when I started to have many and various dogs in the house and to observe their group behaviour for long periods of time, in groups with ever changing composition. I could hardly believe my eyes. There was no dog who always lay on the highest spot. It was always a different dog who was first to go through a door. All of them avoided collisions any way they could, usually by both dogs moving aside a little. The way they behaved around food and toys didn’t follow the rules, either. They seemed above all interested in being considerate to each other and avoiding arguments where possible, not about winning. In fact, none of my own observations confirmed any of what the experts had told me about dogs. I decided to delve deeper into the literature. I also started my own research project. After fourteen years, a totally new picture of canine reality emerged — a reality that means we have to adjust not only the layman’s beliefs about dogs, but also the things science is saying about them. It turns out that many scientists have written about dogs without observing them first hand. When they have, it has been under highly artificial circumstances (in the laboratory). Only a few have attempted to observe dogs in their natural habitat. Many defined this as ‘dogs not under human influence’, failing to see that domestic dogs are always under human influence. Most observed for relatively short periods, or short intervals over a longer period — altogether a few months. In fact, if you want to understand a social species, you have to observe a group of animals in their natural surroundings, and you have to observe them for at least one whole life cycle of an average member of the species. I suppose no one thought we had to do it with dogs, because they are so familiar. We assumed we already knew about them, and that we only needed to work out some details. Wrong. This book is based on real live observations of real live dogs, in their natural surroundings, twenty- four hours a day, seven days a week, for fourteen years. The intensity of my study gave me the chance to discover which information was irrelevant and which was important. It was an anthropological study: besides watching them, I also participated in the dogs’ social system, trying to discover and use their rules of interaction instead of imposing my human ones upon them. By allowing the dogs to teach me, I gave them a chance to contradict the myths we have built up about them — a chance to be heard, as it were. It turned out not to matter at all to the social structure who went through a door first, or who got to keep food or a toy. Those things were different every time, and are not what their social structure is based on. Nor is their social structure based on threat, aggression, or power — perhaps the most damaging myth of all. The dog’s social system is based on a few simple rules of politeness that are aimed above all at not disturbing the peace. So don’t feel silly as you read this book. Despite my education in the behavioural sciences, it took me fourteen years to find the truth amidst all the nonsense. There is, however, one group that definitely should feel silly — the trainers and other ‘experts’ who have blown so much hot air into the world without bothering to make sure they knew what they were talking about. Knowledge about how animals learn has, after all, been available since 1938. But it is science that should be truly ashamed of itself here. At least two whole generations of scientists failed in examining their own motivations and assumptions, in looking critically at their methodology, and — thus — in being fair to this wonderful species we call dogs.